Two months before the North American launch of the Nintendo Wii, the ‘Big N’ revealed a beta for the wii channels menu to the public for everyone’s jawdropping comfort. It’s in japanese but you get the picture. 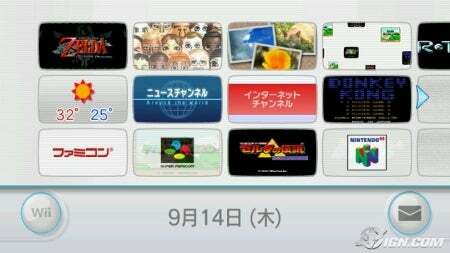 Top left to top right: Disc channel, Mii channel, Photo channel, Wii shop channel. Middle left to middle right: Weather Channel, News Channel, Internet channel, Donkey kong VC game. Bottom left to bottom right: Unknown VC game, Super mario world VC game, Legend of Zelda: Link to the past VC game, Super Mario 64 VC game. One strange thing I observed here is that the beta contains a digital clock towards the bottom centre of the screen. I find that strange because it was removed when released on the wii itself but then was added back in when firmware update 3.0 launched almost one year later, how abnormal. Last updated by U64 Staff & Contributors at 01-06-2008 . Does this description mix up left and right? It’s using left-to-right order, but it says right-to-left. It also leaves out what I think is probably an R-Type game (top right). Oh, you’re right: 14th September (Thursday), isn’t it? Ah, sorry about that minor screw up there. Thanks for fixing it monokoma and as for the time thing, that’s just my guess although it’s anyone’s by the look of it.